When growing Bush Peas it's important to remember that they prefer a cool climate. Bush Peas need a rich soil with good drainage to produce full crop. Bush Peas do not need to be staked. Bush Peas will be ready for harvest when the pod reaches the mature length and the pods are plump but not bursting. 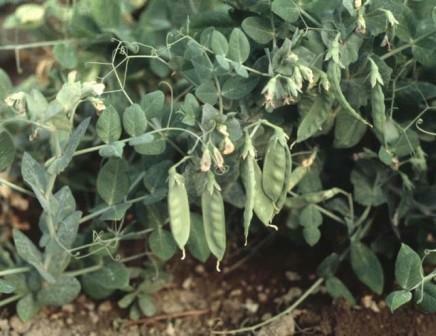 The length of the pea pod varies depending on the variety. Caution: Overripe Bush Peas attain a starchy flavor. Harvest Bush Peas every 2-4 days to encourage continued production. Harvest your Bush Peas by snapping the vine connectors away which hold the pea pods to the vine. Diseases: Alternaria Leaf Spot., Ascochyta Foot Rot, Aster Yellows, Bacterial Blight, Bean Yellow Mosaic Virus., Damping Off, Downy Mildew, Fusarium Wilt, Leaf and Pod Spot., Mycosphaerella Blight, Pea Seedborne Mosaic Virus, Powdery Mildew, Pythium Tip Blight., Root Rot., Seedborne, Seedling Blight, Septoria Leaf Blotch, Stem and Root Rot.